I love just about any protein prepared “Milanese” style. That is, a thinnish cut (pounded thinner if necessary), breaded, and fried crisp. I think a squirt of lemon is de rigueur (I like that with chops, too). I used to just see Veal Milanese, here and there, on more traditional Italian menus, but then I spied a chicken version, Chicken Milanese over Arugula with Tomato Fresca, on the menu of One 53 in Rocky Hill when they first opened. It is still on the menu, and I can see why. I almost never order chicken when I eat out, it is just not interesting enough usually (unless it is perfectly roasted on the bone), and I never understood how anyone could enjoy boneless, skinless chicken breast, something I am always ranting about. But when I saw the Chicken Milanese on the menu at One 53, I couldn’t resist giving it a try, and was an instant convert. Fried breadcrumbs will “cure” anything! And the arugula salad is the perfect complement. They’re smart to put the chicken on top of the salad, too, which keeps the coating crispy. 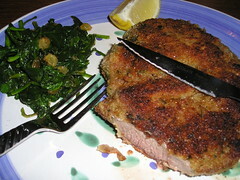 So when I recently saw sliced lamb “steak,” cut from the leg, at Wegmans, my mind flew to the Milanese preparation. It was delicious. I went all out and did the “triple dip”: A dusting of flour, a dip into egg beaten with a little water, and then the homemade bread crumbs I always keep on hand. It could have been thinner, but I didn’t bother to pound it. And it was more than one serving, I had the rest at lunch the next day. That is spinach with raisins next to it, an excellent accompaniment! « Lucy’s got some ‘splaining to do!